KPEG moved its studios to 6019 South Crestline Street on 18 August 1964, where it remained for many years. On 12 October 1970, the station owners changed the callsign to KEZE. This was taken around '72 or '73, and shows KEZE's IGM (International Good Music) automation system. 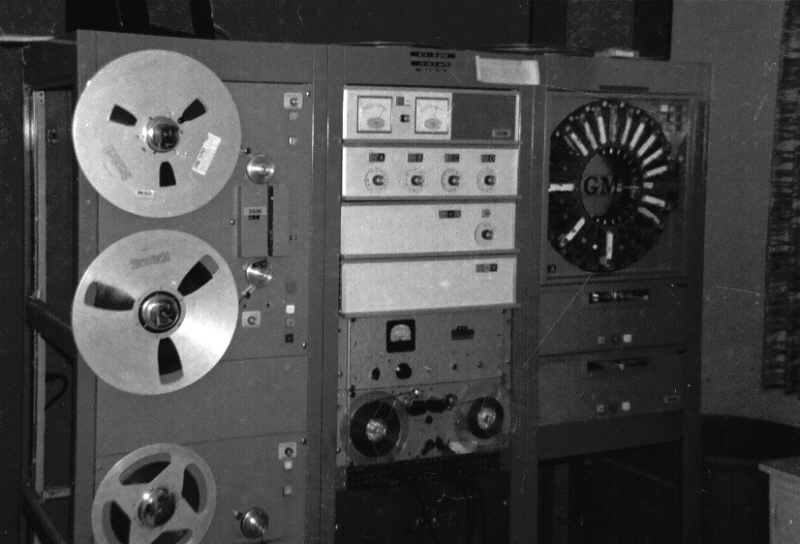 It had two big Scully's on the left, the IGM carousel on the right with a couple single play carts below it and a reel deck used for recording network feeds. The center section contained the sequencers that ran the system. The bottom white panel would slide out and you would plug diodes into a matrix board to program the carousel. I think they named the system "Jerome". Dean Martin, Spokane, Washington. Email correspondance with Bill Harms, December 2008.